We Are Honored To Serve Our Community. Thank you for visiting the Huehns Funeral Home, Inc. & Door County Crematory LLC website. Our funeral home and crematory are both family-owned and operated, with our funeral home providing care for Door County and northeastern Wisconsin families since the establishment of Hahn Funeral Home in 1884 and our crematory now offering on-site cremation, right here in Door County. We are very proud and privileged to be operating in our family's fifth continuing generation of funeral directors with the return of Erik and Brock Huehns. Each life is special and unique. We strive to provide families with services that honor, remember, and celebrate the life that was lived. As a full-service funeral home, we are ready to go beyond your expectations to provide your family with the personalized service that meets and surpasses your family's needs. From a full traditional service to the most unique memorial service, basic direct cremation, anatomical donations, long distance transfers or helping return a loved one to their family cemetery, we are prepared to assist families from every walk of life create a unique ceremony that reflects a life well-lived. Cremation is provided on-site at Door County Crematory LLC. Our family promises to care for your family as our own with a level of compassion and an attention to detail that are second to none. You can always expect such services from us, regardless of the amount expended. Dignity, Quality, Compassion, and Care...Our family caring for yours. Huehns Funeral Home offers families the largest and most-spacious life tribute funeral facility in all of Door County, with three elegantly-decorated, full-size chapels (the largest and most chapels in all of Door County) for families who may not have a church affiliation or simply prefer to have their services held at our facility. Our family takes great pride in the modifications we've made to our facility over the years. From updated/remodeled interior decor and handicap accessible restrooms, to the addition of large flat screens for digital name board use and memorial tribute video viewing, to the installation of wireless internet for (free) public use, to the installation of high-quality sound, to the availability of Door County Coffee, our family is constantly thinking of you. We also offer a private family lounge in a homelike setting, complete with kitchen facilities and a play area for young children. Click Here to view photos of the family lounge. Families are welcome to bring in food and beverages, or we can help cater in food. Again, thank you for taking the time to visit our website. We encourage you to familiarize yourself with it; use it as a resource to learn more about our family funeral and cremation service. For those of you on Facebook, you can Click Here to visit our page on there as well. By "Liking" our Facebook page, you can receive obituaries as they are published, take a virtual photo tour of our facilities, and find out about events going on in Door County. Huehns Funeral Home, Inc. & Door County Crematory LLC has ties dating back to the late 1860s when Francis X. Sailer owned and operated F. X. Sailer Sturgeon Bay Furniture Store, providing undertaking services as a specialty. Mr. Sailer served the community from 1868 until 1889. In 1884, Henry J. Hahn purchased Mr. Sailer's furniture and undertaking service, establishing H. J. Hahn Funeral Home, Door County's first funeral home. H. J. Hahn Funeral Home was located on Third Avenue in Sturgeon Bay and continued until 1944. Years later, in the mid 1960s, Robert Davis (who had worked for Mr. Hahn) established Davis Mortuary. Recognizing the need for additional parking space, Mr. Davis built the (current) Michigan Street funeral home and owned Davis Mortuary until the business was sold to Sylvester "Cy" Dernbach in the late 1980s. Together, Mr. Davis and Mr. Dernbach also provided ambulance services throughout the county. Mr. Dernbach owned and operated Davis Mortuary until 2001 when the funeral home was sold to Todd W. Huehns, a fourth-generation funeral director who had been serving families as a funeral director since 1983 and Door County families since 1992. On January 1, 2001, Davis Mortuary was renamed Huehns Funeral Home to reflect current family ownership and staff. 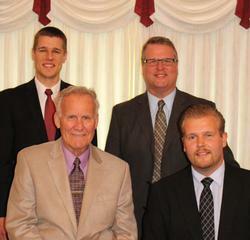 In 2013, Erik R. Huehns became the fifth generation in his family to serve families as a funeral director. Brock J. Huehns will be the second fifth-generation funeral director in his family when he earns his funeral director license in 2016. Door County Crematory LLC was established in 2018 to offer on-site cremation, right here in Door County. This historic funeral service has continuously provided shelter from life's storms for Door and Kewaunee County families. Our family and staff are committed to caring for your family regardless of race, religion or financial need. We are proud to be locally and family-owned and operated funeral and cremation services.